Raymond van Barneveld stayed at the summit of the McCoy’s Premier League table after sharing a 6-6 draw with Robert Thornton in Manchester on Thursday evening. 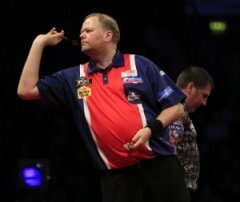 Raymond van Barneveld sealed a hard fought victory over Andy Hamilton in Nottingham as he grabbed his fourth success of the 2013 McCoy’s Premier League on Thursday evening. ‘Barney’ produced a fabulous eleven darter in the final leg to grab the win after a close battle, in which both players averaged over 100. Raymond van Barneveld secured back to back McCoy’s Premier League victories as he saw off Wes Newton in Aberdeen on Thursday evening. ‘Barney’, who defeated Gary Anderson on the opening night in Belfast last week, produced another strong performance to maintain his perfect start to his 2013 campaign. Raymond van Barneveld produced a brilliant performance to defeat Gary Anderson on the opening night of the 2013 McCoy’s Premier League. The popular Dutchman averaged over 102 in a 7-4 success as he got off to a strong start at Belfast’s Odyssey Arena on Thursday evening. Dutch duo Raymond van Barneveld and Michael van Gerwen completed a whitewash over Gibraltar’s Dyson Parody and Dylan Duo. Raymond van Barneveld and Michael van Gerwen began the Netherlands’ pursuit of World Cup glory with victory against the Polish pair of Krzysztof Kciuk and Krzysztof Ratajski. Raymond van Barneveld stormed into the semi-finals of the Ladbrokes World Championship with a fine 5-1 triumph over Simon Whitlock on Friday evening. van Barneveld, who won the Grand Slam of Darts last month ending a five year wait for a major title, remains on course to be crowned World Champion for a sixth time after another awesome display. Raymond van Barneveld cruised to a straight sets victory over Gary Anderson on Thursday evening to reach the quarter-finals of the Ladbrokes World Championship. The five-time World Champion took a step closer to another triumph with a comfortable success at the Ally Pally. 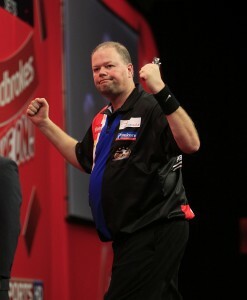 “I’m really pleased with the win,” said van Barneveld, who last won the tournament in 2007. “I never expected to win it 4-0 but I was very confident. ‘Barney’ hit 180′s in each of the first two legs, which were shared, going on to take the first set 3-2. The Dutchman bedded his third maximum in the first leg of set two, but fell behind before winning three legs on the spin to double his lead. A fourth 180 helped van Barneveld edge in front in the third set and he pinned double top to break. Anderson broke back immediately but ‘Barney’ won the next leg to take the set. The reigning Grand Slam champion then reeled off three legs in row to complete an impressive whitewash. 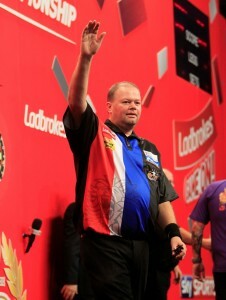 van Barneveld faces Simon Whitlock on Friday evening. 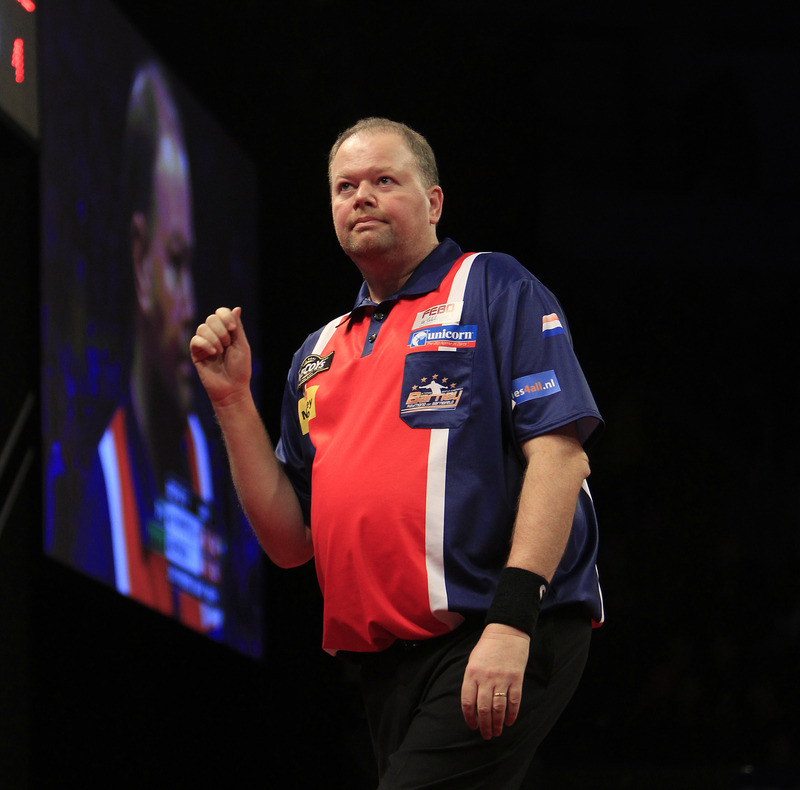 Get tickets to see Raymond van Barneveld at the Belfast Masters. Raymond van Barneveld defeated Brendan Dolan 4-1 to book his place in the third round of the Ladbrokes World Championship, where he faces a mouthwatering tie against Gary Anderson. The 2012 Grand Slam of Darts winner continued his quest to win a second consecutive major title, with a fairly comfortable victory over Dolan. ‘Barney’ took the first two sets but found himself in a precarious position when Dolan won five straight legs. But, with his opponent needing one leg to level the match, The Dutch ace took the next three to move 3-1 ahead before closing out the victory. “I’m happy with the win,” said van Barneveld, the five-time World Champion, who had averaged over 108 in his first round triumph. “Brendan fought back well but I was really pleased to win the fourth set. That probably got me the match. “If you look at the averages compared to the first match, it wasn’t my best but I was a little tired. van Barneveld began in a similar vein of form to his first round victory, averaging over 102 as he took the first set three nil and hitting his first 180 in the process. The first two legs in the second set were shared, before the Dutchman’s second maximum helped to put him in front. He then grabbed a break of throw to double his lead in the match. Dolan hit back, however, as the Northern Irishman took out finishes of 100 and 124 to pull a set back. ‘The History Maker’ produced an eleven-darter to break in the opening leg of the third, before pinning a 103 to checkout to move within a leg of parity. But ‘Barney’ stopped the rot and reeled off three consecutive legs, which included a 93 checkout and his third maximum, to take the set and go 3-1 up. Dolan held his throw in the first leg of the fourth set before van Barneveld pegged him backed, with the aid of his fourth 180. The Dutch legend grabbed a break of throw, bedding double nine, before finishing off the match with a clinical 62 finish. van Barneveld will meet Anderson in the third round on Thursday 27 December.